As most of you are probably aware, Loretta and I are great fans of each other's books. 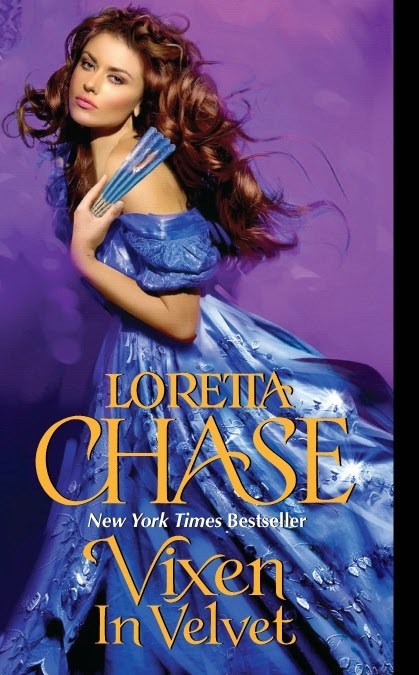 Like the rest of you, I've found it very hard to wait for the release of Vixen in Velvet, Loretta's newest. But the wait is (almost) over. The story of Leonie Noirot and Simon Blair, Marquess of Lisburne, will finally appear at midnight tonight on tablets everywhere, and in stores tomorrow. Isabella: Vixen in Velvet is the third book in your Dressmakers series. Are the Noirot sisters based on a real dressmaking family that you discovered in your research? Loretta: Research led me mainly to individual dressmakers, Mrs. This or That. Studying magazine advertisements, I'd happen on one making irate reference to a sibling formerly with the business and now a rival. (Don't be taken in by imposters! My work is the original/best!) But my three fictional sisters are my own creation. They've survived a horrific experience in France, and they make a very tight family unit, each contributing her particular genius to the business. 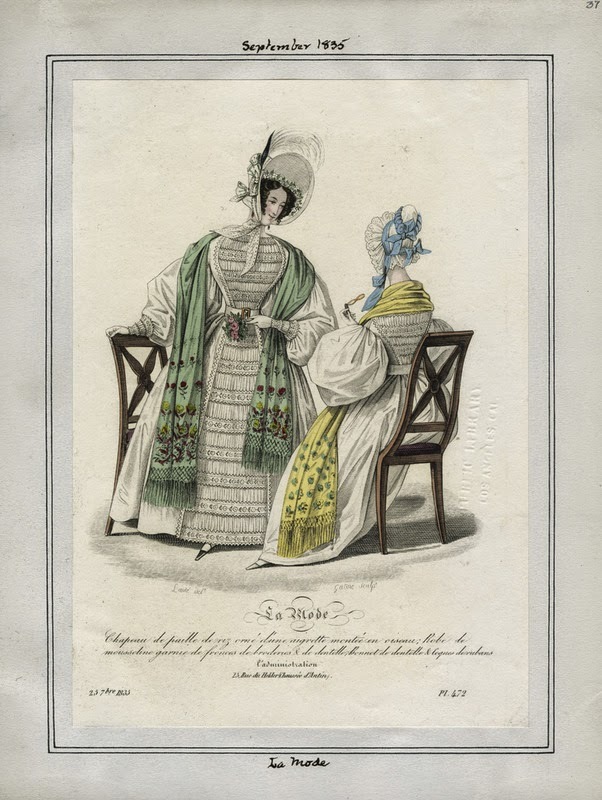 Isabella: You've shared so many divine fashion plates from La Belle Assemblée here on the blog that inspired your descriptions of the clothes in the book. Do you have a favorite? Loretta: I have dozens of favorites for different reasons. We can look at the one I used for the wager scene. I found the fashion plate at the Los Angeles Public Library, but they seem not to have (or haven't posted) descriptions, unfortunately, and I couldn’t figure out what that intricate construction was. 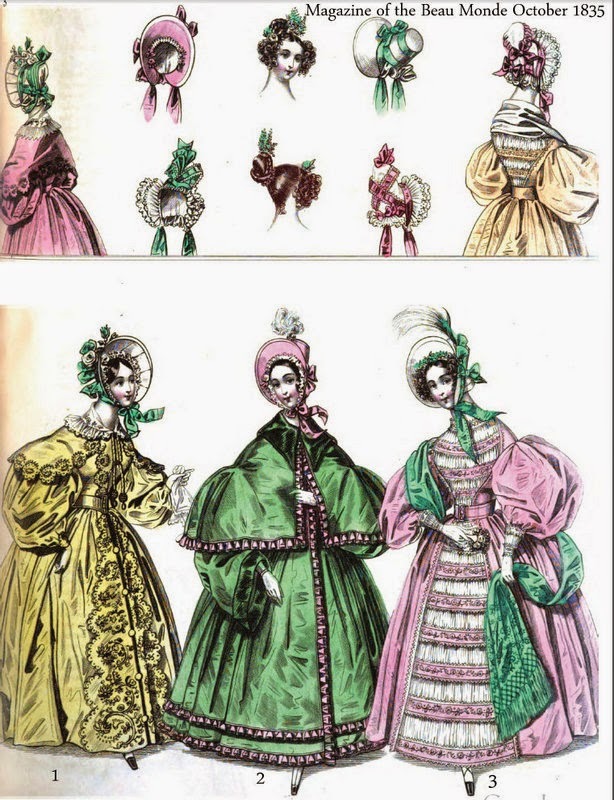 Determined nerdiness, however, led me to the same dress, published a month later in different colors, in The Magazine of the Beau Monde—a lovely example of the flagrant piracy of the time. I’m including both plates & the description. Isabella: For us Nerdy History Girls, research for a book often involves hunting for things that readers don't necessarily notice, the little things that go into creating our fictional, historically-based world. Everyone remembers the splashy ball gowns, but getting the windows right (casements or sash?) for the time period is important, too. Is there anything in this book that makes you particularly proud in a nerdy-history-detail way? Loretta: Fashion, as you say, is the glamorous part. But I'm quite proud of what in one way was tedious: the poetry. The hero's a sort of bodyguard for a superstar poet who's part of the subplot. I had to read reams and reams of very bad poetry to get exactly the right terrible poem in the right scene. Still, the magazines offered comic poetry as well, and that was like looking at satirical prints. So I'm proud of of finding what I think is a good balance of bad and good verse for relevant scenes as well as the chapter epigraphs. I am really looking forward to this book. It has an entry by itself on my calendar, since I don't know what amazon does with preordered kindle books. If I ordered it in advance, I thought it might download or just sneak into my library without my noticing it existed. If you pre-order a book on Amazon, they keep a record (which you can check under your account) and send you a email on the issuing date. You will be billed on the issuing date (but the price will be that offered on the date you pre-ordered) and the book will then download the next time you open your kindle (or kindle app) after that. To avoid being accused of favoritism, I believe the other ebook sellers do about the same. Send them an email to ask about their practice: you may find offers that better fit you (and your bank card). I do wish I would use Barnes & Noble, even when they cost slightly more than Amazon. I have tried, but the last time I ordered a book from them I never could get it to appear on my Nook. Then I followed the directions from their helpful phone person, and lost any record of any of my B&N books on my Nook :-) Fortunately I only had four or five. I mostly use my Nook for Kindle books. On my pc, I transfer all my ebooks to Calibre immediately after I buy them, so the seller can't mess them up.